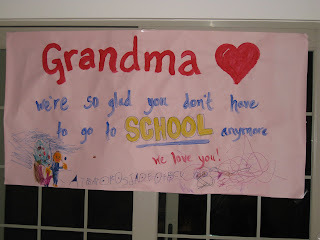 The morning Grandma retired, Jade asked if we could make her a sign that read, "Grandma, we're so glad you don't have to go to school anymore." So, that's exactly what we did. With a cute picture of Jade and Grandma visiting an apple orchard. 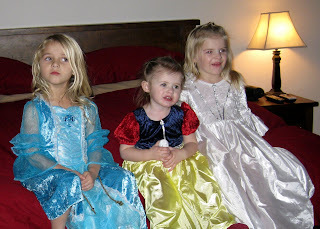 For Grandma's retirement party, the girls played dress up. They actually played dress up every single time they were together. It is great that the big girls would include Ivy. Grandma retired after 23 years of working. I'm so happy that she is finally a "stay at home mom" again. She never felt like she was a working mom, even after 23 years. My mom is an absolutely amazing woman. I think about how she was as a mother to young kids and then as a mother of teenagers. She was always so patient and always took the time with us that we needed to accomplish everything that we set out to do. I trully credit her with who I am today. 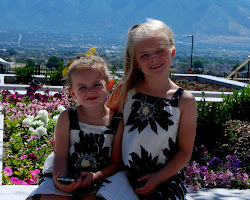 I love her and am so grateful for her example.